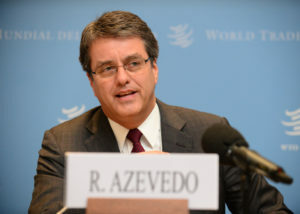 ICC warmly congratulates Ambassador Roberto Carvalho de Azevedo of Brazil on his selection as the new Director-General of the World Trade Organization (WTO). “We are in complete agreement with the statements Ambassador Azevedo has made during the selection process about the urgent need to revive confidence that multilateral trade negotiations can still deliver solid results to benefit the world economy,” said Victor Fung, ICC Honorary Chairman and Chair of the ICC Business World Trade Agenda. ICC and the Qatar Chamber of Commerce and Industry launched the World Trade Agenda initiative at the WTO in March 2012. Its aim is to mobilize the business community in support of harvesting results on trade facilitation and other elements of the Doha Round negotiations at the 9th WTO Ministerial Conference in Bali this coming December. ICC has undertaken an intensive programme of consultations over the past year, reaching out to ICC’s network of 6.5 million companies in 130 countries. “We look forward to working with Ambassador Azevedo and supporting him to achieve concrete results as he assumes leadership of the WTO,” Mr Fung said. ICC was founded in 1919 to promote international trade and investment as vehicles to spread prosperity and peace throughout the world. That remains ICC’s principal mission, and the basis on which it has staunchly and consistently supported the work of the WTO and its predecessor the GATT. “We look forward to actively maintaining that support to help Ambassador Azevedo re-invigorate the multilateral trade system, which has served the world economy so well for several decades,” Mr Fung said. The Peterson Institute in Washington DC recently quantified the potential benefits from ICC’s recommendations in a report entitled Payoff from the World Trade Agenda 2013. It found that by simplifying customs procedures – through trade facilitation measures – alone, member countries would deliver global job gains of 21 million, with developing countries gaining more than 18 million jobs and developed countries increasing their workforce by three million.